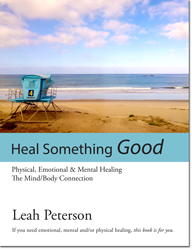 You can buy Heal Something Good at Lulu or Amazon. Heal Something Good is the book I’ve been working on for three years. I learned so much on my journey of healing from autoimmune diseases and mental illness about how our bodies are amazing and how our mental health is intricately connected to our physical bodies. People I meet now can’t believe I used to be so ill, the changes are that dramatic. This book is part Self-Help, part Textbook, part Cheerleader, part Workbook and even includes Grain-free recipes!. It’s packed full of everything I’ve learned and I’m so excited to be able to share it with others. It’s extremely hard when your life becomes a small shell of what it once was and all you can think about is maybe getting out of bed and possibly, maybe taking a shower that day. You lose your job, your social life, your extra-curricular activities, your sleep and finally, you can lose your happiness and joy. Once I started studying in 2010, I soon realized that the steps I was taking towards healing and wellness would apply to anyone at any stage of their own journey. If you are someone needing emotional, mental and/or physical healing, this book is for you! You can buy Not Otherwise Specified at Lulu (paperback) (ebook) and Barnes & Noble. Not Otherwise Specified is my memoir of living with Multiple Personalities for about 30 years. It’s a journal written from the perspectives of seven personalities and it’s a great resource for someone struggling with mental illness. This book led to me being a consultant on the Showtime series, United States of Tara.